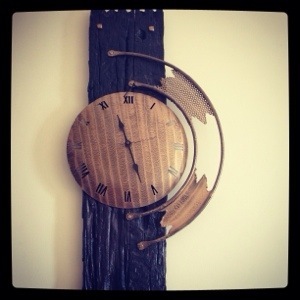 Don’t you just love this hand crafted time piece? I found the retailer at an arts festival, only to discover that his workshop was a 5 minute drive away from home! Voila! We picked this up, and managed to cart it over a thousand miles- this beautiful work of art has served us faithfully, and will soon be carted across the seven seas… Please stay in one piece darling!! Previous 6 beautiful years and more to come! Next A slice of Spain in the Big Apple!